For years the terms “Aurora Branch” and “building fund” were synonymous. The members of the branch devised every possible scheme to add to the fund that would someday enable them to build a chapel. Meanwhile, they met in rented halls and schools for 30 years. 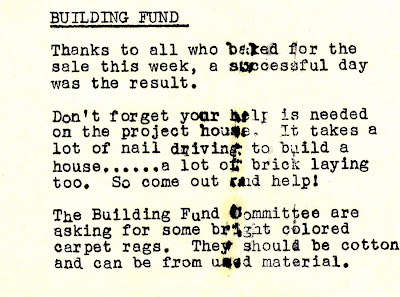 One of the more successful money-raising projects was building and selling houses on speculation. Bob Erekson was a carpenter and building contractor, so he was able to lay out the foundation and direct the work. Most of the men in the branch were handy with tools. 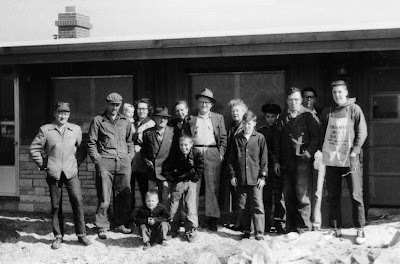 Here some members of the branch building crew pose in front of the house they were building in 1958: Jimmy Greer, Bob Erekson, Louise Erekson holding Jay, Kenneth Ottinger with Marion and John Ottinger in front, Tillie Ottinger, James T. Greer, Myrtle Greer, Barry Woolcott, James Ottinger, Fred Woolcott, Ronald Deans, Mike Woolcott. 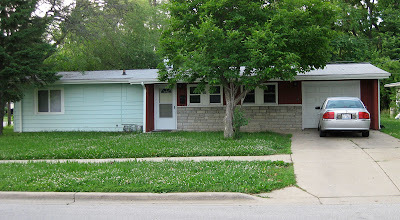 This house is located on the northwest corner of the intersection of New Haven Avenue and Elmwood Drive. Here’s what it looks like now (2009). A tree has been growing in the front yard for many years, but the stonework and dark-stained wood around the windows and door are the same. In a brief hand-written history Myrtle Greer notes that the house was started on October 18, 1957. It sold for $15,800 with a profit of $4,250. She also notes that shortly thereafter the branch built a garage for Dr. Hanson [the Greers’ family doctor] with a profit of $425. While today these may seem like small amounts, they’re impressive when put in perspective. A successful pie supper in 1951 raised $22 and a bake sale in 1962 raised $42.50 (as reported in extant copies of Aurora Branch bulletins).